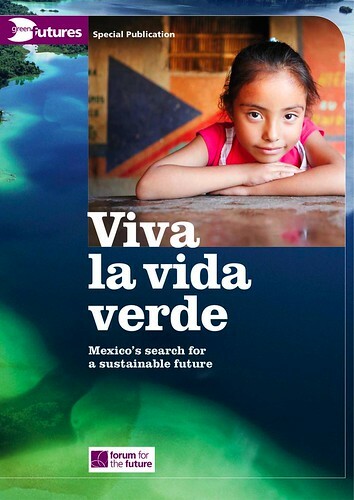 This week Forum for the Future released its Green Futures Special Report Viva la Vida Verde focusing on the continuing search for sustainable practices in Mexico. The report was supported by the UK Government’s Sustainable Development Dialogues, WWF, TUI Travel PLC, Grupo Bimbo and Unilever. Forum for the Future releases the report during a critical year as Mexico hosts the World Environment Day on June 5. Articles include a review of whether President Felipe Calderón put Mexico on the path to a greener life written by Forum for the Future’s Ben Tuxworth and Jonathon Porritt, author of the provocative book Capitalism. In More Energy, Less Carbon Ron Buchanan looks at the country’s efforts to kick the high-carb habit. Jo Tuckman looks at the green revolution in Mexico City. Sun, Sea…Sustainability reviews the ecotourism and sustainable travel movement written by Ron Mader and Ben Tuxworth.